Price from: $2455 - Book now! Day 1: Siem Reap arrival. Welcome to Siem Reap, the provincial capital and gateway to the ancient Angkor temples. Recognized as a World Heritage Site by UNESCO, the Angkor Archaeological Park encompasses dozens of temple ruins including Bayon, Banteay Srei and the legendary Angkor Wat. Upon arrival, our driver and a tour guide will welcome you at the airport and take you to the hotel to check in. We begin the busy but interesting day by a drive from the hotel to the jungle-covered temple of Ta Prohm which is a wonderful combination of human genius and natural beauty with its giant trees that have grown there for centuries. The temple became more famous after Tomb Raider was filmed there. Afterward, explore Preah Khan meaning “Holy Sword”. This is one of the largest temple compounds in Angkor and is defended by four concentric walls. The main shrine and its adjoining buildings are richly decorated with Buddhist motifs and scenes from Hindu epics. Drive further through the North Gate of Angkor Thom to see the enigmatic faces of Bayon Temple that’s known as the heart of Angkor Thom. You’ll also see the intricate base reliefs of the Terrace of the Elephants, Angkor Thom is filled with fabulous monuments on the way to get there. Proceed to the South Gate of Angkor Thom- the beautiful and old Gate with its majestic doors and artifacts. Then, continue your trip to the mysterious Angkor Wat- the largest Khmer temple and finest example of Angkorian art and architecture. Return later to the hotel and the dinner today will be served at a nice local restaurant with Apsara dance. Enjoy breakfast at the hotel then set out for a tranquil countryside drive to Kbal Spean which was the refuge of 11th – 13th century religious hermits and over the centuries they carved linga stands, animals and sacral friezes into the surrounding rocks and riverbeds. Today, a well-marked path leads up the forested hillside to the central area that contains most of the carvings. The walk takes about 45 minutes. After lunch drive to Banteay Srei, home to Angkor’s finest stone carvings. Then, head out of town to Tonle Sap Lake where you will embark on a short cruise visiting the local floating villages. In the late afternoon, you will watch the sunset from the foot of Phnom Krohm Mountain on the way back to your hotel in town. After having breakfast at hotel, you will be free at your leisure until the transfer to Siem Reap International Airport for your flight to Danang – Vietnam. Upon your arrival, be picked up by your private guide and driver to your hotel in Hoi An. 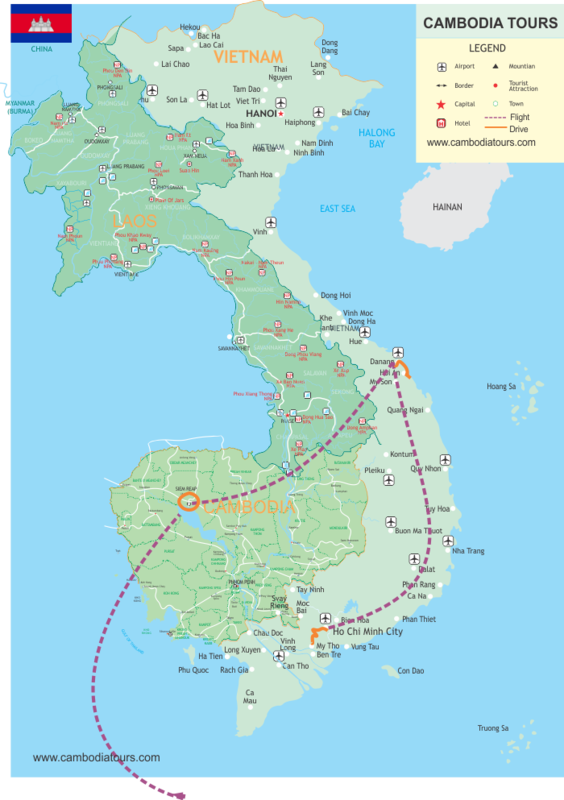 Day 6: Hoi An – Danang- Saigon. Enjoy your tasty breakfast at hotel and transfer to Da Nang airport for your domestic flight to Saigon. Welcome to Vietnam’s modern metropolis: Saigon (Ho Chi Minh City). Upon arrival, our local Saigon guide and driver will meet you at the airport for greetings and transfer through Saigon’s bustling streets en route to the city center. Your afternoon tour explores the Saigon’s diverse attractions. Start with a visit to the former Presidential Palace, stopping at the Notre Dame Cathedral and the City’s Post Office to learn more about the city’s French colonial architecture. Then, continue to the War Remnants Museum before browsing through the amazing array of goods at Ben Thanh Market. Drive to the hotel to check in and spend the rest of time at your leisure. Day 7: Saigon- Mekong a day trip. Today spend a day away from the busy Saigon and drive to Ben Tre Province. Visit Vinh Trang Pagoda, an ancient southern architectural gem in Tien Giang en route. On arrival at Hung Vuong Pier, board on your private boat for a glimpse at the delta scenery while enjoying coconut juice. Experience the unique lifestyle of the Mekong Delta as you visit fruit orchards, coconut groves, brick workshops, and home-made products such as coconut candies, rice cakes, handicrafts etc. After a short walk to visit a local family to learn how they make sedge mat and enjoy tea, tropical fruits, take "Xe Loi", a kind of motorized rickshaw or you can hop onto your bicycle and peddle through picturesque villages (about 20 minutes). Stop at a riverside restaurant for a delicious and filling lunch. Then board a sampan for a relaxing trip along narrow canals. The boat will be waiting for you at the pier nearby to bring you back to Ben Tre where you will catch your car to return to Saigon afterward. Day 8: Saigon - Departure. Enjoy your breakfast at hotel then free until the transfer to Saigon International Airport for your departure flight home.